Introducing “Hot Spots” for Control! Here at Your Tech, innovation never stops. This time we developed coding for what we are calling “Hot Spots”. These little wireless discs fit anywhere, and when your mobile device detects the presence of a hot spot device anything is possible! Imagine walking around your house, and having the music turn on in your living room as you step through the doorway – but only if you are the only person home. Or, as you walk towards your back door, it automatically unlocks only that door, and automatically re-secures behind you. Or even have the television in the kitchen automatically turn on to your favorite news channel as you walk in – but only in the morning when you come in to enjoy your coffee. These are just a few of the possibilities that our new hot spot technology makes possible. As you may know, we recently won a 2017 Electronic House of the Year award. If you were to ask us which technology gave us the leading edge in that competition, we would probably bring up our Geolocation programming. This programming has a simple idea: When a mobile device passes over a virtual line on a map of your house, you can have your automation system play sounds, unlock doors and anything else you want us to program. Similar programming can be done for when you exit that virtual fence to secure and prepare your home for an away mode. But a virtual fence such as this isn’t precise enough; for example it can only tell whether you are near your house or not. 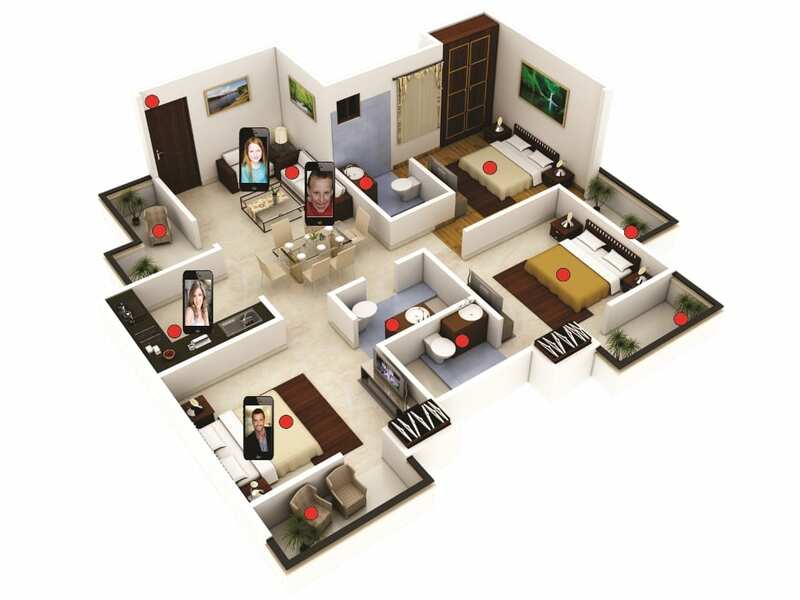 We wanted more detail – to the level of knowing exactly which room you are currently in! How does a Hot Spot work? Place the ultra low power bluetooth hot spot disc anywhere (batteries last for years)! Open the setup app. When your phone is within range of a new hot spot, your mobile device will ask you to name the hot spot and customize the hot spot’s area size (anywhere from 3-40 feet). Open the automation app, choose the hot spot name and an event you would like to happen (such as turning on music/TV/certain lighting as you enter an area). You can also specify that events only happen during certain times or even certain types of weather. You can also specify that events only happen during certain times or even certain types of weather. After that, as long as your phone is with you, the magic will happen! The only limit is your imagination. What can you can do? Anything is possible! If you can dream it, we can make it happen! You can even connect to over 400 online services such as Facebook. If you do not like the idea of having your phone on you, or want events to happen for anyone including guests, combine our Hot Spots with our Facial Recognition cameras! Development for our Hot Spots was done during what we call innovation time. In order to maintain top-notch availability, we created a simple rule: Our clients must utilize a high-end automation system. This requirement ensures our availability for our clients who require superior service, while at the same time improving our training, experience, company culture, and encouraging our technicians to innovate. The very same technicians working in your home use this time to create innovations such as these Hot Spots!